Not everything I think of, or try, works exactly how I originally hoped it would for my Prius Living/Travels. 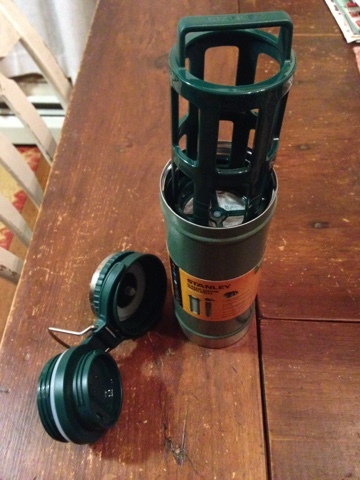 This is the case with the Stanley Coffee Press shown above. 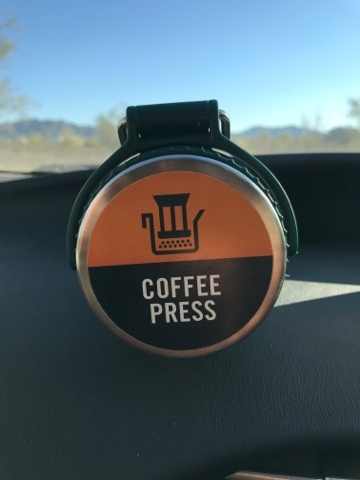 I want to point out that I can't speak to this coffee press as it relates to coffee as I don't drink coffee. I bought the coffee press to make tea. Specifically, herbal, bulk tea. How it works. You put the tea in - then add hot water - close the cover - then let it steep. After your choice of steeping time, you open the cover and insert press and slowly press until it is all the way to the bottom. In doing this you press the loose tea to the bottom as the press has a gasket to keep large particles from floating up. It did make tea but I don't care for hot tea and in the Stanley container that is insulated it stays hot a long time. The press with the strainer on the bottom also allows small particles of the tea around the gasket as you press thus you do end up with some floaters of particles if using loose tea. If you use tea bags you wouldn't have the problem of floating particles. If you bagged your own loose tea it would also eliminate floaters. If you want hot tea and keep your drink hot it works well. Since I do not want hot drinks I found another way to make my tea that I will cover in a different blog. 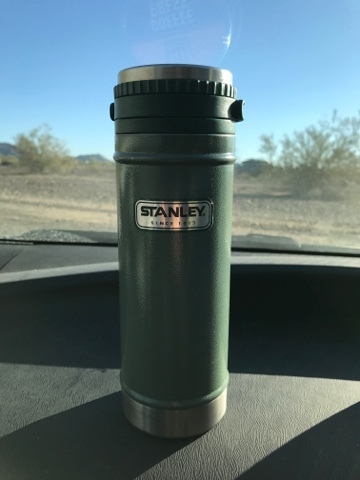 Since I don't have room in my Prius for extra things that I don't use or bring me happiness, I gave my friend Dave from the RTR walks the Stanley Coffee Press as he likes hot coffee.